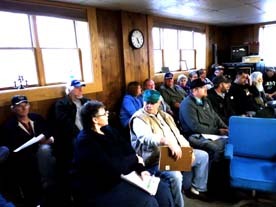 Garrett Neese/Daily Mining Gazette Brian Burke of the Michigan Department of Environmental Quality describes a series of state grants to improve recycling numbers in the state. HOUGHTON — With about 15% of solid waste being recycled, Michigan lags behind most of its neighboring Great Lakes states. The state has rolled out a variety of initiatives and grant programs to boost those numbers, said Brian Burke of the Michigan Department of Environmental Quality (DEQ). 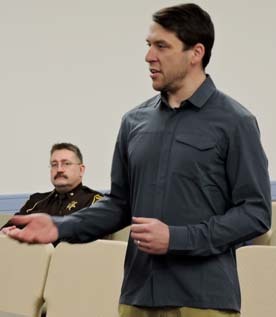 He spoke at a Copper Country Recycling Initiative forum spotlighting various recycling efforts in the community Thursday. In December, the state Legislature approved then-Gov. Rick Snyder’s $69 million Renew Michigan initiative. that includes an annual $15 million each year for state recycling programs. The state is making funds available for material management planning, in an effort to help them redo their solid waste management plans. “Instead of planning for solid waste disposal and having enough landfill capacity, we want them to start planning for having enough recycling capacity, so there’s a place they can send their recyclables to … so they’re actually making plans to send that to a better and higher use than just putting it in a hole in the ground,” Burke said. The DEQ was able to increase funding for Recycling Infrastructure grants from $500,000 to $3.7 million. Eligible projects include everything from transitioning from school recycling projects to improving existing infrastructure. “It’s open to almost any municipal government entity,” Burke said. In past years, DEQ grants have funded projects such as cardboard collections in Houghton and Keweenaw counties, as well as curbside collection carts in Houghton. The state is also offering $250,000 in grants for rural electronics recycling programs, both for adding events or improving existing programs. A one-time offer of $150,000 will go towards increasing recycling for film plastic generated in the agricultural, greenhouse and marine sectors. Another $2 million will be available for grants to help in developing markets for recyclable material. That is open to the private sector in addition to non-profits, universities and local governments. DEQ is also working on information campaigns to improve both the quantity and quality of materials recycled. The push comes as China, the top buyer for U.S. recyclables, has become pickier about what it will accept. The DEQ is working with facilities to develop education campaigns where they inspect recycling bins; in cases where the person has included nonrecycleable materials, such as greasy pizza boxes, they’ll leave a friendly note and follow up with educational materials. “If it’s two or three times and the same person doesn’t learn, they’ll leave the bin there,” he said. Another statewide education and marketing campaign will focus on ensuring people understand the importance of recycling and how to do it locally, as part of the state’s goal of tripling its recycling rate to 45 percent. The $15 million is slated to continue each year. Burke would like to see half go to the solid waste planning. “It’s a significant investment of them to form a committee and do the research they need to do developing it and we want to foster that money for them to do well with that kind of thing,” he said.